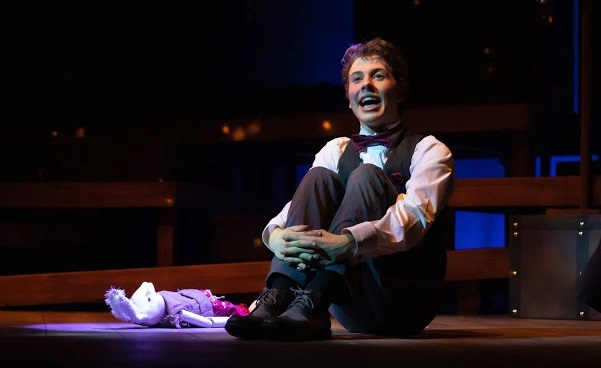 The Miraculous Journey of Edward Tulane was adapted by Childsplay’s Artistic Director Dwayne Harford, based on the award-winning children’s novel by Kate DiCamillo. When last presented in Tempe, the play’s epic tale with a large cast of characters was played by just four adult performers. It was a remarkable piece of theatre. For this reviewer, it was 2014’s play of the year. Five years later, that same play is currently in production across town in Phoenix at Valley Youth Theatre, playing now until February 24, but there’s a difference. This time, director Carolyn Marie Wright has taken Childsplay’s original script and restructured it. Instead of a story told by four actors playing several roles, there is now a cast of fifteen filling the stage, yet none of the creativity that went behind making four performers look like a cast of many is lost. VYT’s production, with a different set design and an overall different look, actually benefits from individual character casting. When Edward, the china doll of the tale, is lost and feels that even the stars of a sparkling night sky are mocking him, the stage is filled with young actors holding lighted orbs as they each voice a biting line of dialog that Edward believes is directed specifically at him. And at a later time, when the narrator (here called the Traveler) revisits Edward’s misadventures and presents all at once the array of characters and the conflicts he has encountered throughout his miraculous journey, the stage becomes populated with a full cast who stand and face the audience, each one there to have their moment under a spotlight before exiting both the stage and Edward’s life. The tale of a rabbit whose head is made of China begins in the 1930s when the doll is given to ten-year-old Abilene (Kate Williams). The rabbit’s name is Edward, and though Edward is clearly an inanimate object, we hear his thoughts. The physical presence is humorously played by Andy Wissink who stands nearby and observes, often commenting on what he hears. “Somehow I make the pinstripes work, don’t I,” he remarks with just a touch of vanity as young Abilene dresses him. But Edward’s comfortable life with the little girl who clearly loves her doll will soon end. On an ocean-going trip on the RMS Queen Mary, Edward is accidentally thrown overboard by two mischievous boys, resulting with the doll lost at the bottom of the sea. 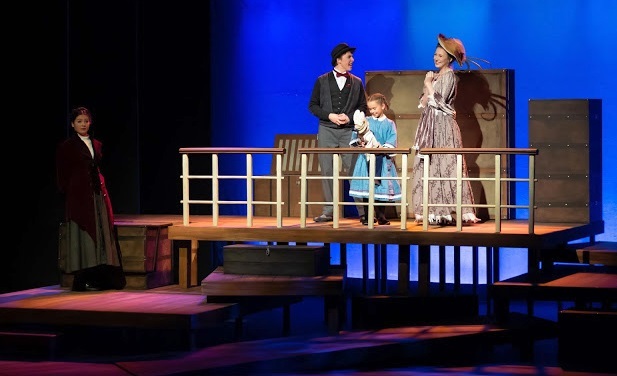 Dori Brown’s scenic design consists of a series of raised wooden platforms of varying levels played against a screen upon which the sun rises, the sun sets, and night stars are projected. Slot a group of handrails on the upper level and the set becomes the deck of an ocean liner. Open the doors of a large wooden crate standing upright and it becomes a boxcar on a train. It’s very effective. In addition to working with Dwayne Hartford’s script from Childsplay and redeveloping it for VYT, this new production also benefits from Kyle Sorrell’s music score. Originally played live with acoustic guitar and violin, here it’s used as a soundtrack to the action while creating an atmosphere that makes the telling of Edward’s journey appear as though a genuine piece of American folklore in the vein of Johnny Appleseed or Paul Bunyan is now unveiled. Among the show’s many strengths is the talented fifteen member cast who reenact Edward’s story. Each brings a distinct individual quality to their moment on the stage, a testimony to the high standards demanded by a VYT production. 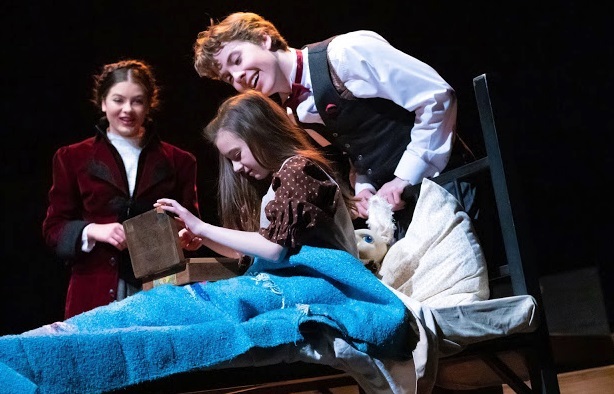 By including Edward Tulane in its 30th Anniversary season and doing it as well as it is done here, VYT doesn’t simply honor Childsplay, it illustrates how well the two groups complement each other. And while with a cast as large as this, mentioning every performer would turn this column into a laundry list, special mention must go to the actor whose presence and professionalism are felt throughout the production. Called the Traveler, Jordan Baker is the play’s narrator, relating events as she walks among the characters and sets the scene. 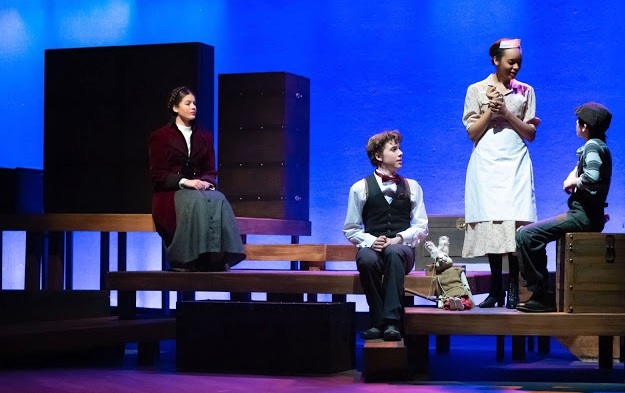 Like the Stage Manager in Thornton Wilder’s Our Town who both narrates and occasionally integrates himself into the action, at times Jordan’s Traveler assumes the role of a grandmother or even a bird and becomes part of the moment. When she does, it’s as if the spirit of the character enters her body and possesses. She twists and turns her hands and arms, assumes a hunched position, and for just a moment she becomes that person. Once the moment is over, the spirit leaves and the traveler is free to straighten up and return to her normal stance and voice. With an assured presence that belies her youth – Jordan is only fifteen – and her inexperience – this is her first role with VYT – the actor is extraordinary and a genuine find. Director Wright has crafted a production that VYT can be proud of. 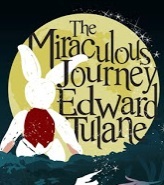 The Miraculous Journey of Edward Tulane as presented at Valley Youth Theatre on North First Street is something quite wonderful.